Current mods: underdrive pulleys, 306 balanced and blueprinted, E303 cam, 3.73 gear and auburn posi, MSD ignition, subframes, aluminum driveshaft, BBK control arms. Just added BBK shorty headers July02,2001. The Headers really made a difference on the top end. 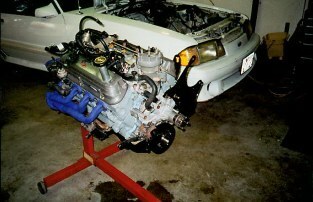 This was my first engine rebuild.